The Sonoma International Film Festival runs Through Sunday, which is the only day for the Albany Film Festival. A- Elevator to the Gallows, Castro, Thursday. Louis Malle launched his directing career, and arguably the New Wave, with this noir tale of a perfect crime gone wrong. Laced with dark, ironic humor, the film cuts back and forth between a murderer (Maurice Ronet) trapped in an elevator in a building closed for the weekend, the murderer’s lover (Jeanne Moreau) wandering the streets searching for him, and two young lovers enjoying a crime spree in a stolen car (they stole it from the murderer). And all of is set to a powerful jazz score by Miles Davis. Read my longer comments. On a double bill with Orson Welles’ The Trial, which I saw long ago and didn’t like. B+ The Red Shoes, Lark, Sunday, 1:00; Wednesday, 5:30. This 1948 Technicolor fable about sacrificing oneself for art makes a slight story. Luckily, the characters, all fanatically devoted to their art, and all very British, make up for it—at least in the first half. Unfortunately, the final hour weighs down with more melodrama than even a well-acted film can bear. On the other hand—and this is why The Red Shoes holds on to its classic status—the 20-minute ballet sequence is a masterpiece of filmed dance, and no other picture used three-strip Technicolor this expressively. I’ve discussed The Red Shoes in more detail. 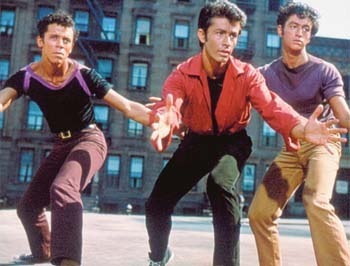 B West Side Story, Balboa, Thursday, 7:30. West Side Story swings erratically from glorious brilliance to astonishing ineptitude. The songs and dances–especially the Jerome Robbins-choreographed dances–create a world of violent intensity and eroticism that both carry the story and shine in their own right. I’d be hard-pressed to think of a better choreographed widescreen musical. It also contains magnificent supporting performances by Russ Tamblyn, George Chakiris, and especially Rita Moreno. But the dialog is often stilted and stage-bound, and juvenile lead Richard Beymer is so bad he sinks every scene he’s in. See West Side Story in 70mm for more on the movie–even though the Balboa will not be showing it in 70mm..
A- Selma, New Parkway, opens Friday. 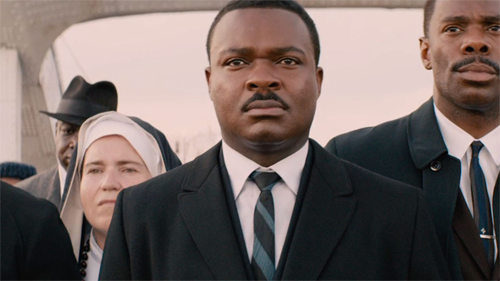 I found it difficult at first to accept David Oyelowo as Martin Luther King and Tom Wilkinson as LBJ. They didn’t look and sound right. But as the film progressed, I accepted them and got lost in the powerful and (unfortunately) still timely story. I had no problem accepting Carmen Ejogo’s spot-on perfect performance as Coretta Scott King. The film’s biggest strength comes from its picture of King as a flawed human being filled with doubts, exhaustion, and guilt–a man who would lie to his wife, badly, about his infidelities–but still a great hero. The film’s biggest mistake was letting us meet this real person before showing us the great orator that he is his public image. 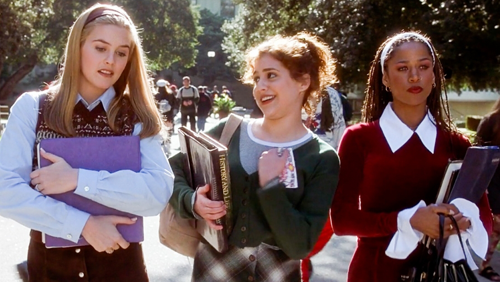 B+ Beyond Clueless, Sonoma Woman’s Club, Thursday, 3:15. Charlie Lyne’s documentary examines the thrills, terrors, and transitions of teenage life through the looking glass of high school movies. Just about every feature film focusing on adolescents from the last 20 years makes at least a cameo appearance, from American Pie, Election, Spider Man, Mean Girls, Pleasantville, Donnie Darko, and, of course, Clueless. The uncredited narrator goes into detail about a few movies–including Bubble Boy, Disturbing Behavior, and The Faculty–to examine issues like peer pressure, sexuality, and moving on with your life. Not particularly deep, but useful if you are, recently were, or have a teenager. And certainly entertaining. Part of the Sonoma International Film Festival.